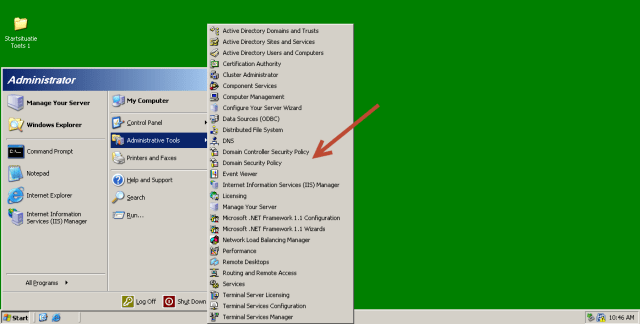 Wat is het verschil tussen “Domain Controller Security Policy” en “Domain Security Policy” in Windows 2003? Op dit moment is een van mijn klassen bezig met Windows 2003. Ik krijg veel vragen over het verschil tussen “Domain Controller Security Policy” en “Domain Security Policy” in Windows 2003. Bij deze het antwoord. The Domain Controller Security Policy applies the security policy to all domain controllers within your domain. The Domain Security Policy applies to all computers (including domain controllers) within your domain. Oftewel: instellingen die je in de domain controller security policy maakt gelden alleen voor de domain controllers in je netwerk. Instelling die je in de domain security policy maakt gelden voor alle machines (clients en servers) in het netwerk. The domain controller security policy exists to allow you to give special policy settings to your domain controllers that are independent of the rest of your servers and workstations. If you don’t really need anythign special defined for your domain controllers then the domain security policy will suffice. However most people at least want certain services not needed on the domain controllers to be turned off but the same ones left on for workstations. So the settings for those services in the domain security policy would need to be overridden by settings in the domain controller policy. Oftewel: als je policy instellingen voor alle machines in het domain moeten gelden, dan gebruik je de domain security policy. Mocht je voor je domain controllers willen afwijken van de policy dan gebruik je hiervoor de domain controller security policy instellingen. Facebook Graph Search & Privacy! ?